To my mind, there are few meals as satisfying, simple, and versatile as roast chicken. Adjusting a basic recipe by one teeny bit can turn your baby-it's-cold-outside wintertime comfort food into a hot-time-summer-in-the-city beercan chicken barbecue dish. And while it takes almost no skill whatsoever to make a good roast chicken, it takes a ton of practice to get it perfect. 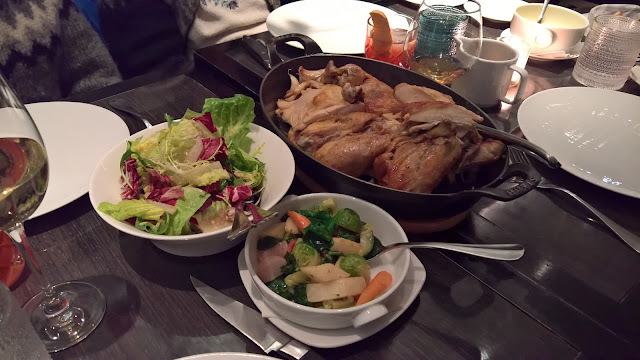 So when I learned that a three-star Michelin chef (Antoine Westermann) was shifting gears away from frou-frou French cuisine and turning to his true passion - roast chicken - I knew I needed to get over there. A bit of backstory as to why one would shell out bocu bucks on a chicken. The typical chicken you get at the supermarket is young. Chicken grow up fast; the average time from infant to adulthood is about seven minutes. You know those ads where the cute little chick pops out of the egg? By the end of the day, that bird is using a walker and complaining about hipsters. The thing about chicken is that the meat adds flavor over time, so the older the chicken, the better. If you're the kind of person who complains that chicken is bland, this is why. The thing is, the longer the chicken stays on the farm before it winds up in your kitchen, the more expensive it gets, so the reason that Le Coq Rico's birds SEEM as expensive as they are is because the restaurants wanders the country looking for farms that will raise them to the ripe old age of three months instead of three weeks. In Europe, some farms will hold onto them for a year or so, but that isn't financially tenable here. The days of a $400 chicken dinner are a ways away. 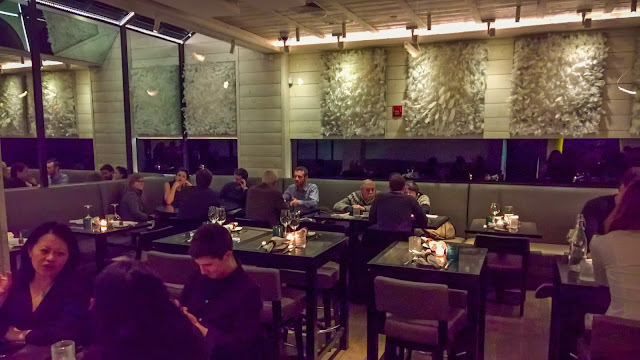 I arrived with my parents and Bro around 7pm to a packed house and a lost OpenTable reservation. But for the fact that I did the manager a solid a few days earlier, there was no way we were getting a table until ten. But he remembered me, told the hostess to ignore the missing reservation, and we were whisked off to literally the next available table. 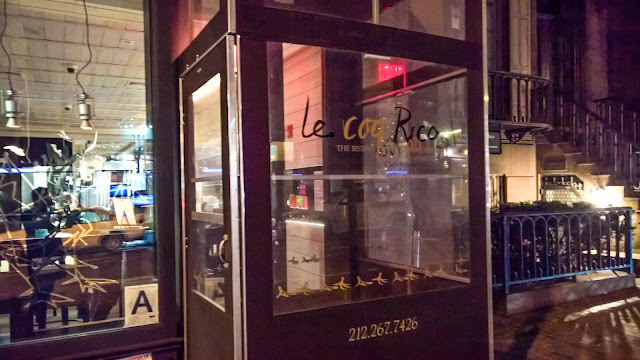 The interior and the clientele of Le Coq Rico is upscale, as one would expect from it's Gramercy/Flatiron locale, but it's also relaxed. You won't be out of place here in a sport jacket or slacks, but you can easily get away with jeans and a sweater, as I wore. The waitstaff was upbeat and happy, attentive and helpful, but not hovering to refill your water after every sip, or scrape the table of crumbs between bites. We ordered a few glasses of wine while debating which chicken to get and we enjoyed a basket of bread that came to the table. "This bread is amazing!" my mom remarked. "We make it here," said our smiling and clearly quite proud waiter. 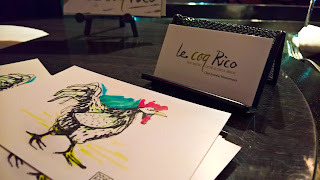 Le Coq Rico is, at it's heart, a roast chicken place, although they do have a few other dishes (duck, guinea fowl) for people who think that chicken is beneath them. It was not beneath us. When you order the bird, you order them whole, and they come diced for the table. Should a whole chicken be too much for your table, or perhaps you're dining alone, or perhaps you're with a handful of whiny brats who insist on having just a salad or the scallops or some other such inane nonsense, they do serve a portion of their menu as individual plates so that you can enjoy their signature dishes while plotting a way to never eat with those people again. We ordered the bird that the waiter most recommended, the Brune Landaise, a chicken aged 120 days, as well as a side of mashed potatoes and mixed vegetables. The whole birds come with nothing but a small salad, so side dishes are extra. The chicken came diced into chunks and we served ourselves from the cast-iron skillet. It was very good. Moist, tender, perfect skin, no grease. At no point while enjoying the meal did either myself or anyone else regret ordering this dish. The best way to describe the difference between this bird and your "standard" chicken is in the richness of the breast meat. The breast meat was almost like a thigh. It was almost dark, which makes sense, given that the reason that thigh meat is dark is because it's used more than the breast. The older a bird is, the more use each muscle gets and the darker its meat becomes as a whole. Our only complaint was with the sides, and the complaint there is that they're just too small. Our waiter said that each side could be shared by two people and, unless you only need three bites of mashed potato or one Brussels sprout, this just isn't the case. Order one side dish per person. That said, the sides were good and the mashed potatoes specifically were fantastic. Easily the smoothest I can remember having. 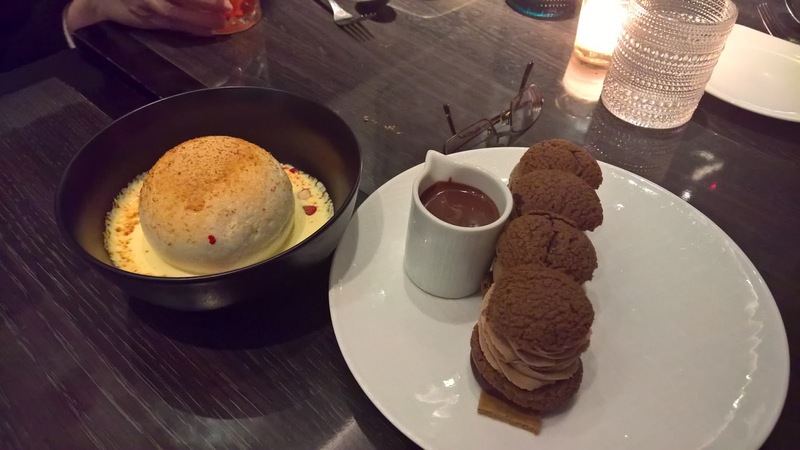 For dessert, the table split two desserts, the Creme Caramel and the 100% Chocolate Profiterole. In my mind, the creme caramel was better. It was light and sweet, creamy and guitless-feeling (though it's all sugar, so really it's still pure guilt). The caramel pudding came with little candies fruits buried within, though I didn't really notice them. The profiterole was fully chocolate. Chocolate puffs over chocolate cream, and with a warm drizzle of chocolate sauce to round it out. But I'm not a chocolate guy, so take my mom's word for it that she recommended it. The chicken was $100, the sides and dessert were around another $15 each. Earlier on, I said that $100 for a chicken SEEMS expensive. Here's why that's an illusion. We divided the chicken between four people. That's $25 per person. That's not quite as good a deal as the Pio Pio near me, where a whole chicken and five sides is $36, but a quick scour of the menus of nearby restaurants of this class-level will show that $25 is pretty average.